Those aren’t about coercing involuntary statements, but rather to rebut the argument that Miranda warnings shut down voluntary statements that otherwise would have been made. We’ll be getting to the finer details pretty soon! 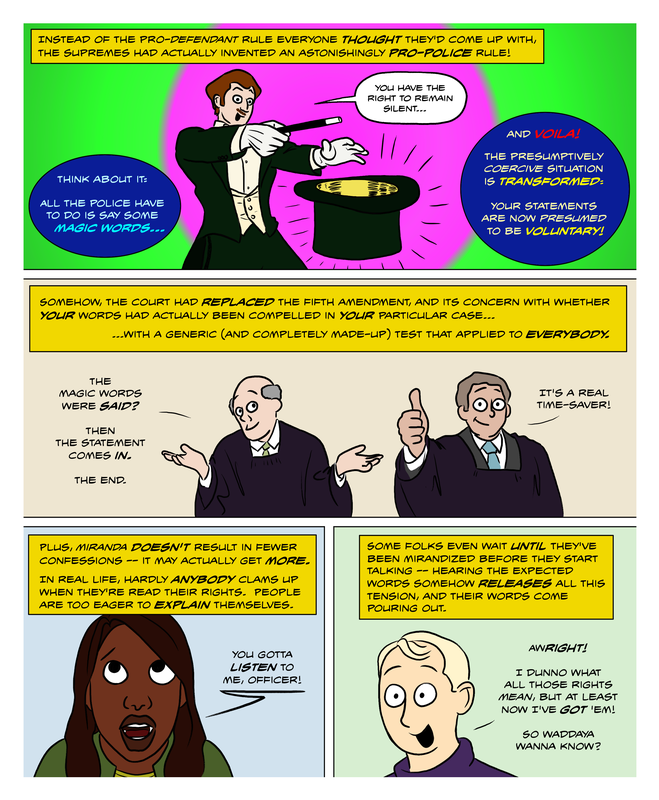 That last panel exemplifies a rather interesting problem with the Miranda warning – it’s so ingrained in pop culture that, while people definitely know about it, they’re not entirely certain what it -means-. They think it’s just empty words, a formality, verbal fine print. As for people who know their rights, and talk anyways, well…as much as we try, can’t always protect the stupid from themselves. I probably wouldn’t call them stupid — not all cases anyways. Think about it: your heart’s pounding, people are yelling, your arms are behind your back and handcuffed… even if you know those rights, you’re not exactly going to be thinking clearly. Your mind’ll still be in that “fight or flight” mode. You’re probably more likely to blurt out something you’ll regret saying much later. Then again, there are some true dolts out there. Also, most people think of themselves as being good, even if they do something “wrong”. If someone feels guilty about something, they may be eager to get it off their chest. It may take a bit to figure out that the very sympathetic cop is probably not the right person to unburden your soul to. So, not stupid, maybe a bit naive, and definitely not at their best time for thinking. I was a bit confused about how the Miranda warning could be a bad thing at first, but I think I’ve got it now; it doesn’t actually stop them from interrogating people except in the minority of cases where the victim – sorry, suspect – takes them up on the offer. In most cases, they get to use testimony and rather than asking if it was coerced, the court just asks if Miranda was given. Is that right?